Fill out the form on the front page, send us an e-mail to unicar.fo@gmail.com or call us on phone +298 544 000 in order to get a rental car offer. If you wish to accept our offer, we will reserve the car for you, send you an e-mail with the booking details, and an invoice for the deposit. When we have received the payment of the deposit, we will send you an e-mail in which we confirm the rental. About 10 days before the rental we will send you the invoice for the rental amount. A deposit of 2000kr is required in order to get a confirmation of the booking. (The deposit is 2500kr for luxury cars and 4000kr for camper rental) The deposit is paid in addition to the rental amount and not as a part of it. The deposit will be refunded to you after the rental. This gives us the possibility to subtract the fee for any additional sub-sea tunnels trips, a car returned without a full tank, parking tickets and the likes, should it be nessecary. The deposit will be refunded with PayPal to the same credit card used to make the payment for the rental. If the rental was paid by bank transfer, remember to send us en e-mail with your bank account details, so that we can transfer the deposit back to you. The customer pays for handling fees from PayPal or the bank. The self-risk costs are 9990kr at the most, for one damage. How much is to be paid in self-risk depends on how severe the damage to the rental car is. If the hiring person is not responsible a written confirmation from the counter part must be submitted. All material damages must be reported to the police. Selfrisk-insurance can be included in the rental for 100kr/day. In case of damage to the car the amount to be paid is maximum 1500kr per damage and in case of theft 1500kr. Damages to the car when the driver has been under the influence of alcohol or because of some other reasons is not able to drive the car in a safe manner. Holes burned on seats and mats. Damages to the bottom of the car, when driving on a bad road. The cost for towing the car, if the car has gone off the road. There are two sub-sea tunnels in the Faroe Islands. 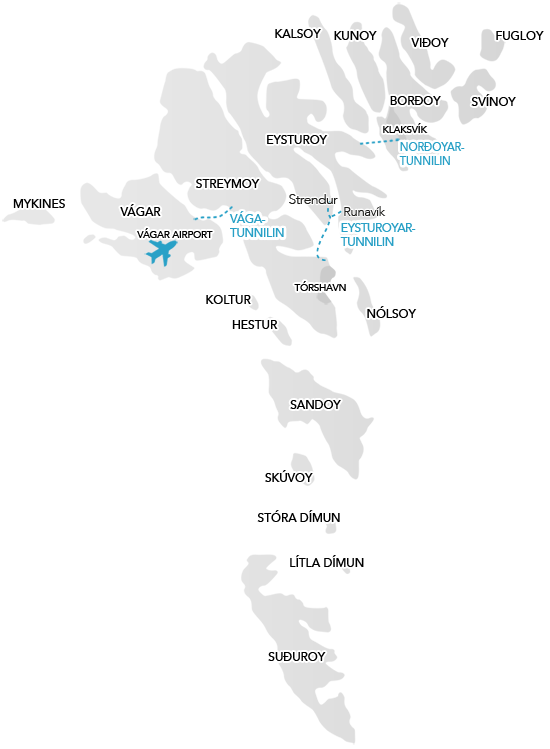 One which connects Vágar (the island where the airport is) to Streymoy (the islands where the capital Tórshavn is) and one which connects the island Eysturoy to Borðoy (where the town Klaksvík is). The sub-sea tunnels have an automatic system, that registers the car’s license plate number and then sends the bill afterwards. We charge 80kr for a trip back and forth through the sub-sea tunnel. We will subtract the fee for driving through the subsea tunnels from the deposit. With all equipment in the car in the same condition as it was when picking up the car, this includes documents, tools, extra equipment etc. If something is missing or destroyed during the rental, we will charge it off the deposit. With a full tank. If the rental car isn’t delivered with a full tank, we will charge the fee for fuel + 200kr for filling it from the deposit. Fairly clean, meaning that waste, food etc. shall not be left in the car. The car shall not be covered in dirt. If the car is delivered extremely dirty, we will charge a fee from the deposit for taking extra time cleaning the car. Smoke free. It is not allowed to smoke in the rental cars, an amount will be subtracted from the deposit should we notice the car has been smoked in during the rental. On time. If the car is not delivered at the time agreed, you may have to pay for this, if you do not call us beforehand to let us know that you will be delayed. You are welcome to call us to ask if it is possible for you to have the car longer than stated in the agreement. The deadline for cancellation in order to get a full refund is 14 days before the rental start date. With cancellation 7 days before, we will charge you half of the deposit, and after this all the deposit is charged. We do not charge anything for changes of car, or rental period, but we have no guarentee that we do have cars available. The car has to be returned fairly clean and emptied for anything that is not part of the car's own equipment and accessories. So everything you have brought with you of food, spices, paper, waste, etc. must be taken out of the car upon return. Otherwise, a fee will be charged from the deposit. We recommend that the car's sewage tank and the PortaPotti toilet only are emptied at the designated draining stations / toilets and that waste will only be disposed of in waste containers. Together we look after nature. Fill out the form on the front page, send us an e-mail to unicar.fo@gmail.com or call us on phone +298 544 000 in order to get a rental car offer. If you wish to accept our offer, we will reserve the car for you, send you an e-mail with the booking details, and an invoice for the deposit of 1500kr. When we have received the payment of the deposit, we will send you an e-mail in which we confirm the rental. About 10 days before the rental we will send you the invoice for the rental amount. Selfrisk-insurance can be included in the rental for 100kr/day. Selfrisk-insurance can be included in the rental for 100kr/day. In case of damage to the car the amount to be paid is maximum 1500kr per damage and in case of theft 1500kr.